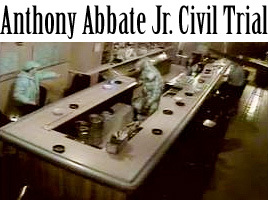 The Anthony Abbate, Jr. Civil Trial: And This Verdict Means What Now? When a federal jury on Tuesday found in favor of Karolina Obrycka and found the City of Chicago and Anthony Abbate, Jr. responsible, and awarded her $850,000 in compensatory damages, Obrycka said she was glad that justice had been served. Her plans now are to get on with her life and put the incident behind her, her lawyer Gustavo Munoz said. Munoz added that she's still terrified of Abbate, even though she hasn't had any contact with him except during legal proceedings. In fact, she's terrified of the police and of men she doesn't know, Munoz said. "She'll only deal with cops in a public setting with other people around," Munoz added. Abbate couldn't be reached for comment but his attorney, Michael Malatesta, stated that he was well aware of what might happen after the jury saw the infamous video. "It's difficult for people to separate any type of emotion from it," he said. Malatesta also said that like Obrycka, Abbate is trying to put this incident behind him and get on with his life. This verdict is believed to have opened the door for other people who have allegedly experienced police brutality and believe their cases are being scuttled due to the "wall of blue." Even though the "code of silence" is a popular storyline in Hollywood, the Obrycka verdict made it real, and difficult for the city elders to ignore. "Plaintiffs will hire experts and cite this case to prove that the 'blue wall of silence' exists," said Munoz. "Pandora's box has been opened." Mayor Rahm Emanuel was quick to respond to the verdict with his typical bluster — any police officer or officers caught engaging in such activity will face serious consequences. Whether the mayor has this kind of power will be something to watch for, since past Chicago mayors and police chiefs haven't exactly had warm and fuzzy relationships. Nor have former police superintendents actually acknowledged that a "code of silence" permeates the police department. Of course, a top cop isn't going to say his charges cover up for one another when there is bad behavior, and not all police officers are bad seeds. In fact, according to experts, the number of wayward cops is a small one. Finally, the Chicago Police Department doesn't exactly have a stellar reputation, so this verdict is seen as yet another bruise on the reputation of an already damaged department. Dennis Waller, a police practices consultant, former policeman and expert witness from Brookfield, WI, said he believes that the "code of silence" within the Chicago Police Department will never go away. It's too ingrained in the system, he said. "Chicago fights, ignores and denies the behavior," he said. "It's the culture coupled with strong union presence and a city council that has given away a lot of management control to the police department through collective bargaining." The city stated it is disappointed with the verdict and will appeal. Munoz said they will "defend the appeal vigorously." As for Abbate, Malatesta seemed contemplative. "I'm not sure if Mr. Abbate will appeal... not sure if there is a basis for appeal. My first reaction is to the let the verdict stand and not drag it out any longer." Julia Gray is a freelance journalist who has written for the Beachwood Reporter, Time Out Chicago and TheStreet.com. She is also the occasional co-host of the Internet radio show "The Matthew Aaron Show," where she has interviewed folks like humorist Kelly Carlin, actors Timothy Busfield, Craig Bierko, and producer Mark Canton. Feel free to check out her blog.